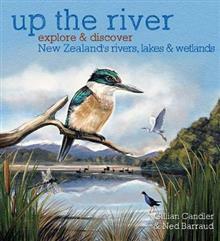 The sixth title in the award-winning `explore & discover' series, Up the River: Explore & discover New Zealand's rivers, lakes and wetlands gives children an opportunity to look under the surface and see what special creatures live, around New Zealand's freshwater habitats - our ... read full description below. The sixth title in the award-winning `explore & discover' series, Up the River: Explore & discover New Zealand's rivers, lakes and wetlands gives children an opportunity to look under the surface and see what special creatures live, around New Zealand's freshwater habitats - our creeks, rivers, lakes and wetlands. Included in this title are animals ranging from the familiar p-u?keko to the rarely seen bittern, from the iconic eel to tiny whitebait, and some of the many barely known aquatic insects. Swimmable and drinkable fresh water are hot topics, and Up the River shows that many native animals depend on healthy waterways for a habitat, and their presence is often used as a sign of the water's health. Beautifully illustrated and impeccably researched, this is a wonderful and intriguing way for children to learn about New Zealand's freshwater environments. Previous `explore & discover' titles have: won the Elsie Locke Medal for non-fiction (2013), received Storylines awards (2014, 2015) and been finalists in the NZ Children's Book Awards (2013, 2015). GILLIAN CANDLER is an award-winning writer for children. She has a passion for nature and is an active member of conservation groups. Gillian's involvement in conservation projects has seen her identifying geckos, feeding fairy prion chicks, counting birds, making seed balls and trapping pests. Gillian blogs about nature at ExploreDiscoverNatureblogspot.co.nz. She has a background in teaching and educational publishing and believes that picture books can be both fun and educational. NED BARRAUD is an illustrator with a keen passion for the natural world. He illustrated the five previous titles in the award-winning `explore & discover' series, along with his first children's fiction title, Moonman. When not illustrating, he works on films at Weta Digital as a texture artist and enjoys exploring the outdoors with his wife and three children.